If you have a friend or two who need a little push to come and try out the great fun of Salsa dancing, we are offering completely FREE beginners classes for any of your friends who may want to try us out. It's only valid for complete beginners as an introductory offer. Just forward them this link, and they can PRINT OUR FREE CLASS VOUCHER HERE. No catch, just print voucher & bring to any of our classes!! 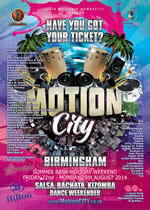 Still one of Birmingham's best Salsa nights in the whole week. If you need a regular great salsa, bachata & kizomba fix, come and join us here every Tuesday night with loads of dancers, fun loving crowd and great atmosphere guaranteed. We now have 2 rooms playing mainly Salsa & Bachata til 12am in the main room and Kizomba in our alternative afro-luso room til 11:30pm. We have introduced a 15-20mins freestyle practice session in between the 8pm and 9pm classes. We invite all levels to come early to join in too, dancing with everybody and helping developing that dancing confidence that people can only get from social dancing. PARTY will be as normal from 10m-12am. Check out some photos here. We run progressive 8pm TASTER DANCE SESSIONS, alternating between ChaChaCha, Kizomba, Rueda, on2 & Bachata, ladies styling, technique, etc. Please try to attend every week so that teachers can progress every time. Come to Solihull and join our great Team DJ Kev, Brighon, Gary Thomas, Jan, Jo & Sonia every Wednesday for the optional 8pm taster session, and a great set of top salsa classes at 8:30pm followed by freestyle / social til 11pm. Always a friendly bunch of dancers and a perfect place to develop and practice your moves! Just turn up any week (incl. beginners), and join in the fun. Doors open at 7:45pm. It's a fantastic function room located on the outskirts of Birmingham & Solihull on the B425, just off the A45 (Coventry Rd). We are using the Meadows Function Room right next to the HUGE free & secure car park. The room holds approximately 200 people, has a beautiful wooden dance floor and is self contained from the ice rink, having its own private entrance, bar counter and toilet facilities. The BAR is OPEN too which makes the social dancing time even more like a proper party. Please spread the word, and obviously don't bring drinks in as we'd like to keep the bar and your support there is essential. 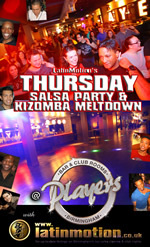 ...that's right Birmingham salseros & kizombeiros, please note that we are back running our 2 ROOM Thursday Salsa & Kizomba nights at PLAYERS bar & club every week (formerly known as Bliss)! THE VENUE IS FABULOUS! IT'S EVEN MORE PERFECT FOR DANCERS THAN BEFORE WITH AMAZING DANCE FLOOR. SO COME JOIN US THIS THURSDAY & INVITE ALL YOUR FRIENDS, IT WILL BE GREAT!!!! Please spread the word but remember to arrive early to make the most of it, as Salsa finishes at midnight, and then it's Kizomba melt-down. 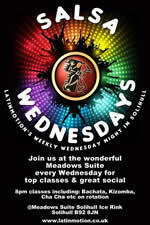 WEEKLY CLASSES are as normal from 8pm and then 2 ROOM SALSA & KIZOMBA PARTY from 10pm-12:30 (or later). If you haven't been for a while, come and join us for great music, sound system, air con, dancefloor, and now back in one of our favourite club rooms. We also have a 15-20mins freestyle practice session in between the 8pm and 9pm classes and invite all levels to come early to join in too, dancing with everybody and helping developing that dancing confidence that people can only get from social dancing. We really love this venue and this night which we've been lovingly crafting for all the keen salsa dancers over the last few years. We are normally on 2nd Saturday of each month, and we post specific dates & details here. It's a top salsa night, with a huge beautiful sprung wooden dance floor, and great music to boot with resident DJs Mauricio Reyes & Gary Thomas plus regular guest DJs too. Doors open at 8:45pm with 4 separate levels of Salsa Workshops at 9pm with resident teachers Irfan, Brighon, Jose Perez, Don Walters, Gary & Jayne, plus regular special guests. The venue is perfect for dancing, and we mainly play a hot selection of SALSA, Mambo & Cha Cha Cha plus a light sprinkling of Bachata & Kizomba to add to the mix. 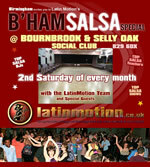 If you like your salsa nights like this, JOIN US and please help us spread the word too. All feedback about previous events has been overwhelmingly positive, so we feel totally reassured that this is a perfect venue for a big night for salsa dancers in Birmingham, and worthy of attracting keen dancers from all over the UK. The Bournbrook & Selly Oak Social Club is lovely, but above all it's perfect for dancing with a HUGE Sprung Wooden Dance floor, and perfectly positioned seating & bar areas. We are talking about fun Cuban Salsa Party nights, with the friendliest crowd, fun Rueda classes and line-ups, plus spontaneous Ruedas forming throughout the night, excellent guest teachers & djs, fab sound system, awesome Cuban Salsa tunes, Live percussion, etc, etc... Put the dates in your diary and come prepared to have fun! We've had some awesome 'cuban salsa' guest teachers, djs & performers such as ULISES from Havana, DAMARYS (Havana), OSBANIS (Manzanillo, Cuba), MISAEL CORDERO (Santiago de Cuba), KAREN 'SalsaRoja', MOE FLEX, ALAIN HERNANDEZ (Havana) with CUBAnia dance company, YERSIN RIVAS (Cienfuegos, Cuba) and LEANDRO CHARANGA & NATALIE all who taught great cuban style classes & played a fab cuban salsa music too. We are lining up loads more special guests for the future. They've all been excellent, so if you want to experience the top Cuban salsa Birmingham has to offer, just come join us and please spread the word to other like-minded salseros! We are playing a healthy selection of great Cuban salsa... Los Van Van, Manolito, Bamboleo, Cubanismo, Maikel Blanco, Charanga Habanera, Isaac Delgado, Habana D'Primera... to name but a few... plus a dash of Bachata, Kizomba & other great Salsa too! 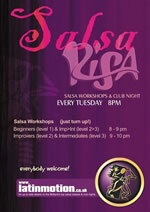 If you like your salsa nights like this, don't miss it, it's promising to be HOT HOT HOT! JOIN US and please help us spread the word too! Our much loved St Anne's Club in Birmingham is back in full swing. It was shut for over 2 years due to a refurb that almost didn't happen, but finally it's back and perfect for a SALSA & BACHATA night in the centre of Brum. We are now running it as a monthly special event, and we post specific dates & details here. 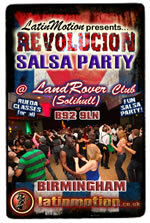 PLEASE ALWAYS SUPPORT THE BAR & HELP KEEP OUR FAVOURITE SALSA VENUES & NIGHTS ALIVE!!! It is really tough at the moment, specially due to the current economic situation. 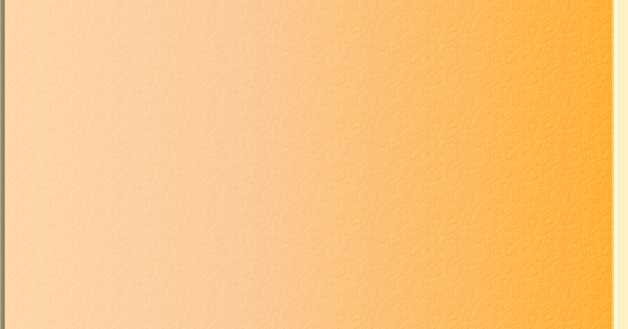 We must remember that like all of us, venues are also under a lot of pressure at this time, having to cut down on all costs and focus on the parts of their businesses that will help them survive. On some occasions venues find it even more cost affective to close their doors and shut for a night completely if they don't believe they can cover their opening costs. Over the years we have been very lucky in Birmingham and have been able to get some brilliant venues to dance every week, and have even enjoyed loads of nights with completely free admission, but this is becoming unsustainable in the current climate, and we're having to become more proactive to ensure the survival of some of our favourite, and longest running WEEKLY nights, unless we just want to end up having only monthly parties which can charge a lot more on the door. I've spoken to loads of people and taken a lot of advice, and hope we have come up with a solution that we think is fair to all. Please support it as otherwise we WILL loose some of our favourite nights and at best, we'll have to settle for less good venues, have to move around all the time, or we could simply loose them forever. We've had numerous meetings with venues too, who to be fair, have really supported salsa in Birmingham lots over the last decade and enabled us to run lots of weekly parties as well as special events. In order to finance & keep our much loved weekly socials/freestyle sessions running, we are going to have to introduce a small admission charge for social dancing without classes. Some venues will also be running drinks promotions on the bars too, so please still support the bars. We can only keep the nights/socials running with your support, admisson charge and drinks bought are paying to provide the service/entertainment of the salsa night and all the associated bar opening costs. As a fellow salsero told me (thanks Steve), it pays for the drink it self; the glass it comes in; someone to wash the glass for you before your purchase; someone to collect the glass from you after you've finished; the venue and its décor/ambience; the person on the door; SECURITY; toilets & washroom facilities; someone to clean the venue; a dancefloor; effects lighting; a sound system; heating; air conditioning; etc. It will pay for electricity; Gas; Water Rates; Business Rates; Manager & Staff; Lease/ Mortgage; Stock; and hopefully make a little profit at the end which will have to have tax paid on it too. I hope I'm not labouring the point too much, but we really need your support in this to ensure the longevity our much loved weekly salsa nights.